Anthony Skeets is a prolific Navajo silversmith who works in the Traditional Revival style of smithing. He is best known for the bracelets he makes, but he makes a whole range of jewelry in traditional style from earrings to concha belts and often does fine cluster work. 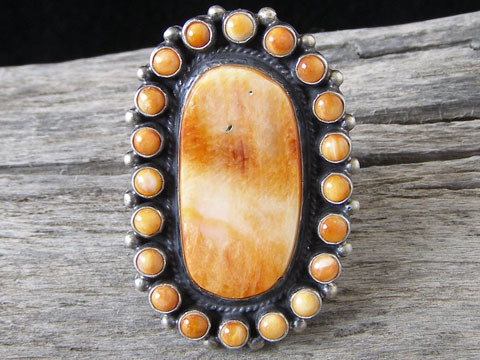 This over-sized cluster ring has a large, free-form cut of orange spiny oyster at its center surrounded by twenty small rounds of matching spiny oyster forming the border of the ring face. The shank of the ring is formed by four lengths of round wire, fused on the sides and in back to form a solid band. Nicely "antiqued" to give this a patina and old-style flavor. Note the dimensions cited below; this is a large ring, not for the shy at heart! Hallmarked "AS" and stamped "Sterling" on the ring back. Dimensions of ring face: 2" x 1 5/16"